Men in the midst of mid-life crises like to say that, “The only difference between men and boys is the size of their toys,” and Chevrolet appears to have taken that mantra seriously. The Bow Tie brand showed a Camaro inspired by Hot Wheels at this week’s Specialty Equipment Market Association (SEMA) show in Las Vegas. The Camaro Hot Wheels will go into production in limited numbers in early 2013. The Camaro Hot Wheels sports Kinetic Blue paint, a grille and rear spoiler from the Camaro ZL1, a new front lip and side skirts, and some matte black trim. Befitting a good cross-promotion project, the Camaro also comes with a healthy dose of Hot Wheels badges. What really makes Camaro look like a Hot Wheels car, though, are the redline wheels, which look like they were taken straight off a 1:64-scale racer. To match the red wheel trim, the Camaro Hot Wheel’s interior has red stitching and red-accented floor mats. In case owners forget what kind of car they’re in, Chevy also added door sill plates that say, “Hot Wheels.” Chevy’s MyLink infotainment system is also included, although it would probably be easier to operate if the Camaro was driven on a grooved orange track, and the driver didn’t have to steer. 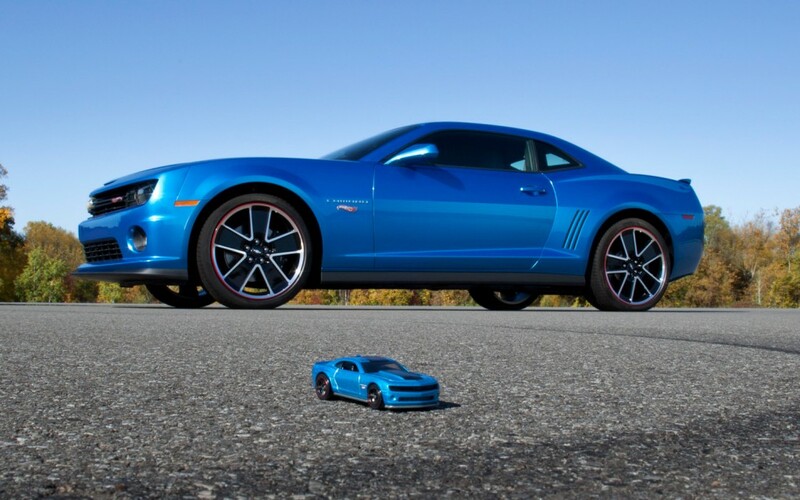 Thankfully, the full-size Camaro Hot Wheels is motivated by more than gravity. 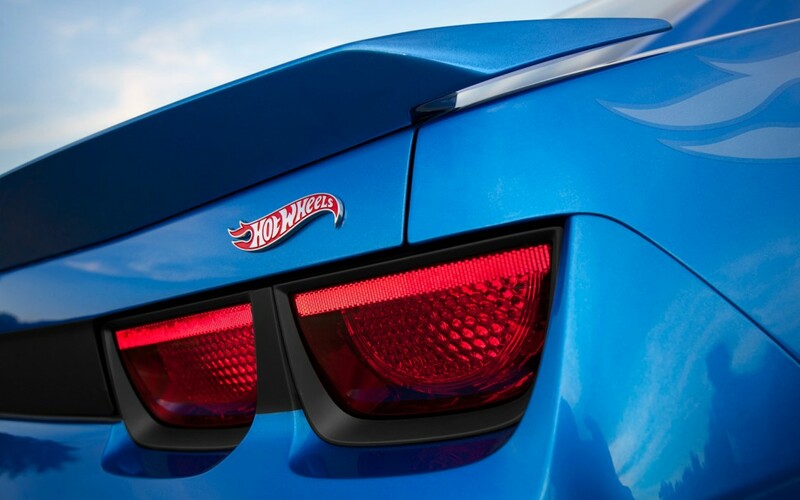 Like the standard Camaro, the Hot Wheels is offered with either a 323-horsepower, 3.6-liter V6 or a 426-horsepower, 6.2-liter V8. Either engine can be had with a six-speed manual or automatic transmission. The Hot Wheels edition will be offered in both coupe and convertible body styles. This isn’t the first time Chevy has released a special Camaro based on a toy. A Transformers edition car reminded people of the Camaro’s starring role in the eponymous giant robot movies, and even came with Autobot insignia. Last year, Chevy showed a bright green Hot Wheels Camaro concept at SEMA. Chevy consider the tie-in with Hot Wheels especially appropriate because the Camaro was one of the original Hot Wheels cars. The toy line launched in 1968, one year after the 1:1-scale Camaro’s birth. The Camaro Hot Wheels will cost $6,995 more than the top Camaro 2LT (V6) or 2SS (V8) trim levels. Chevy did not say how many full-size Hot Wheels cars it would build, but the brand is calling this Camaro a limited edition. “When they’re gone, they’re gone,” company representatives said. Hot Wheels collectors love to find rare models and seal them away in the hopes of making a killing on a rare factory paint scheme or error. So the question is: Will anyone drive the Camaro Hot Wheels, or will it stay in its blister pack?